FFA members now have access to the FFA Pass Exchange program! See below for a list of currently participating festivals. Want to apply for a festival pass or add your own? Login > Resources > Access FFA Member Benefits > Pass Exchange Request Form/Pass Exchange Offer Form. Applicants will entered into a lottery (if necessary) and will be drawn at random – there is no preferential treatment! Recipients will be notified shortly after the application deadline. FFA has partnered with SXSW to extend discounted rates on registrations to attend the 2019 South by Southwest® (SXSW®) Conference & Festivals. FFA members will be able to access exclusive pricing for this year’s SXSW event that extends to all badge types: Interactive, Film, Music, and Platinum. SXSW celebrates the convergence of technology, film, and music industries. Fostering creative and professional growth alike, SXSW® is the premier destination for discovery. To activate the discount, FFA Members should Login > Resources > Activate Member Resources > SXSW Registration Discount. *Applications for the 2019 SIO Diversity Pass Program are now closed. Check back in fall 2019 for the 2020 applications. Through a partnership with the Film Festival Alliance, the Sundance Industry Office will offer five complimentary and five deeply discounted SIO Passes for the 2019 Sundance Film Festival, to FFA Members who identify as historically underrepresented festival professionals, in an effort to cultivate diversity within the film festival industry. Applicants must be current members of FFA, or belong to an organization who is a current member; and may not have received a comp SIO Pass for the 2016 or 2017 Sundance Film Festivals. *Read below for important information. *If your organization is already an SIO member, you will not need to register through the SIO office, and may still apply to obtain an SIO Pass after October 19th if you are not selected for the Diversity Pass Initiative. *If you/your organization is NOT an SIO member, you will also need to email SIO@sundance.org to in addition to filling out the Diversity Pass Program application. If you are selected for the Diversity Pass Initiative, you will automatically be enrolled as an SIO member. If you are not selected for the initiative, you will need to wait for your SIO membership application to be approved in order to purchase a pass. 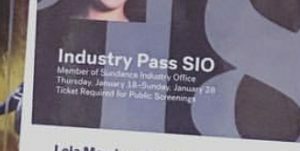 *If you are definitely planning to attend the 2019 Sundance Film Festival, you should still apply for the SIO Pass through the SIO office; if you are selected to receive a comp or discounted pass, your credit card will not be charged or your price will be automatically discounted, respectively.